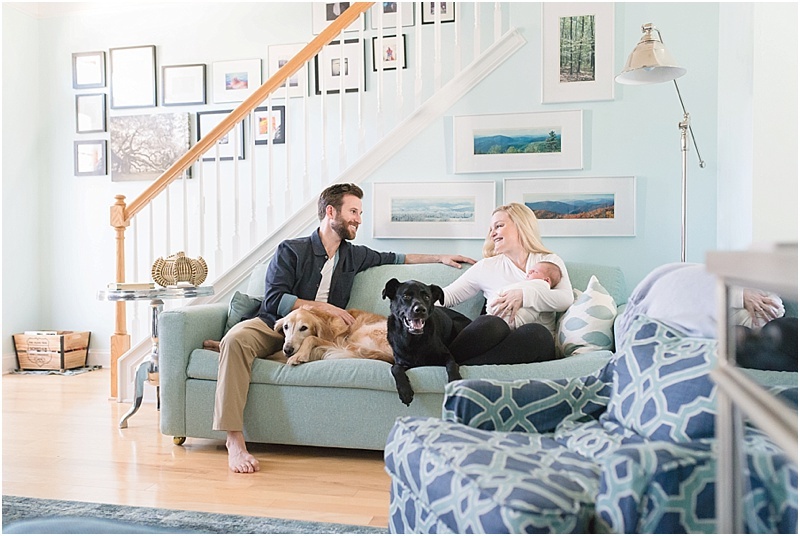 Six Reasons You Should Choose a Lifestyle Newborn Session — Northern VA Newborn, Maternity, and Family Photographer serving Ashburn, Leesburg, Purcellville, & Loudoun Co. I remember when I started this journey to becoming a photographer and owning my own business here in Northern Virginia that I had this idea in my head of what newborn photography "should" be like. I felt like if you didn't plop a baby in a basket or have their heads perfectly posed, propped up so sweetly on their hands or in a 'taco' pose, then it wasn't a legit newborn session. I stressed and stressed over trying to fit into this mold and I can distinctly remember not really liking newborn sessions because I felt so much pressure to pose a baby perfectly and patiently shush them until they did exactly what I wanted them to do. I felt like that if I didn't do it that way, I wasn't a 'real' newborn photographer. It didn't take long for me to say THAT'S NOT FOR ME! And thank God I did! Because as soon as I accepted that posed newborn photography wasn't who I was, the more and more I loved my newborn sessions! That love has grown to the point that now they are one of my favorite types of sessions to do! Don't get me wrong, I will stop dead in my tracks when I'm scrolling through Instagram and I come across a GORGEOUS posed newborn baby. I have mad respect for posed newborn photographers...MAD respect! But it's just not my thing, and I have to embrace the person that I am in order to be the artist that I am meant to be. I thought that it might be helpful to moms who are researching photography for their newborn baby to highlight some of the reasons that a lifestyle newborn session might be just right for you, just like it is for me! 1. You don't have to go anywhere! Lifestyle newborn sessions take place in the comfort of your home rather than having to put your sweet little bundle in the car seat, pack up ALL THE THINGS to come with you, and stress over arriving to a studio on time. That gives you the precious gift of time and Lord knows we all need it right after having a baby. 2. Show off that nursery! In addition to not having to go anywhere, you also get to showcase what makes your home a special place for your family and newborn baby...especially the nursery that you dreamed about and worked so hard on! The nursery is one of my favorite things to document when I am doing a lifestyle newborn session and I think that Northern VA mommies have such amazing style! 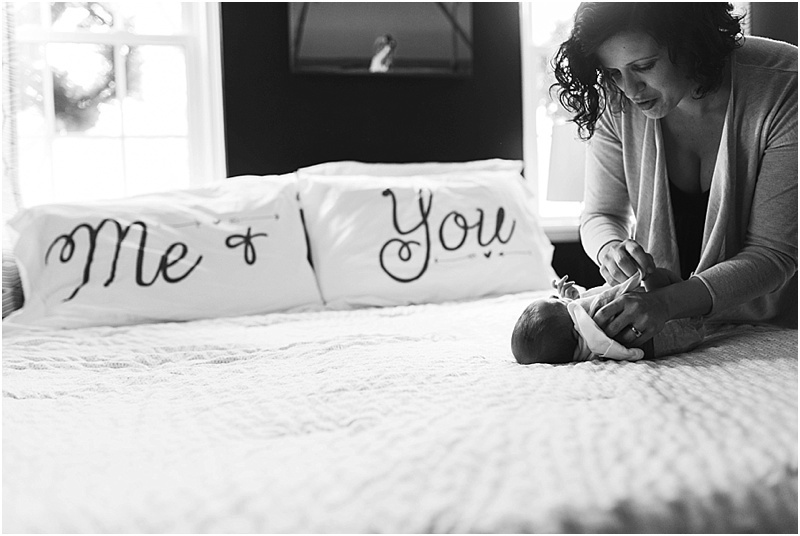 That little room is one of the first acts of love that parents get to do for their child and it is so special to take photos that will help you remember it long after they have outgrown it. 3. You can include your pet. They are a part of the family too and it is really amazing to watch the special bond that develops between pets and newborn babies. 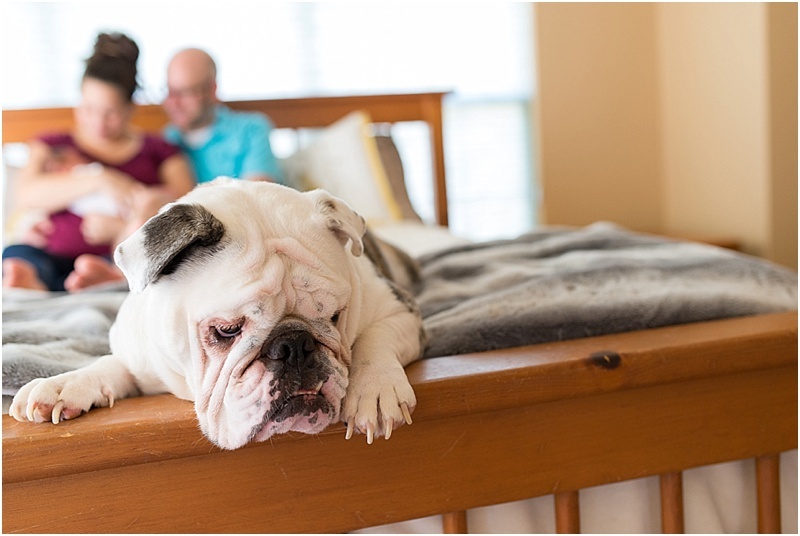 With lifestyle newborn sessions, pets can get in on the action too! This is especially important in families who have aging pets so that you can show your child pictures of your first 'furbaby' to help them remember him or her for years to come after they are gone. 4. Flexibility of scheduling. For posed newborn sessions, there is usually a very strict window of time (oftentimes the 5-10 day old range) that is ideal for the curliest, sleepiest, happiest babies. 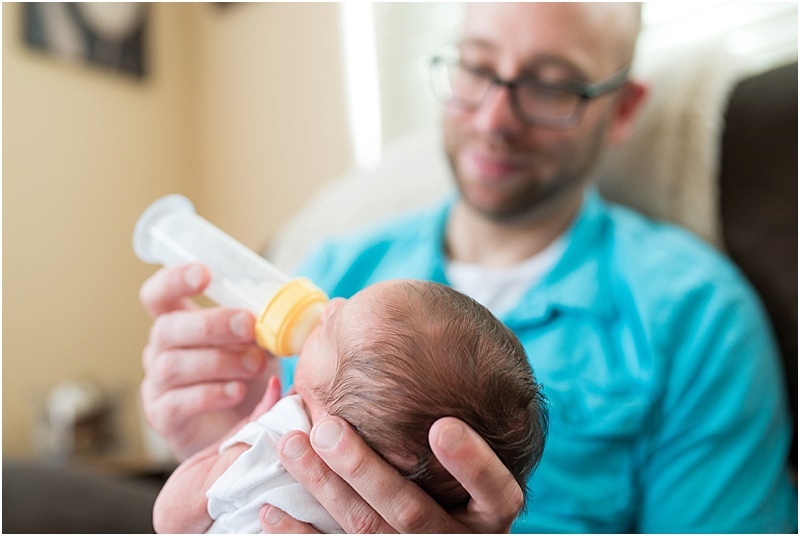 I too usually recommend holding lifestyle newborn sessions during the first two weeks, but it's really no big deal at all to go beyond that timeframe if you would like to. I've done newborn sessions all the way up to six weeks old! Sometimes you have family in town and things are too busy. Sometimes you have a rough delivery and you need time to recover. Sometimes moms didn't think they wanted newborn photos, but then change their minds! The beauty of lifestyle newborn photography is that it is totally ok to go beyond the first two weeks if you would like to! 5. It tells a story. One of my favorite reasons that I love lifestyle newborn photography is that the images tell a beautiful story of this special time in your life. 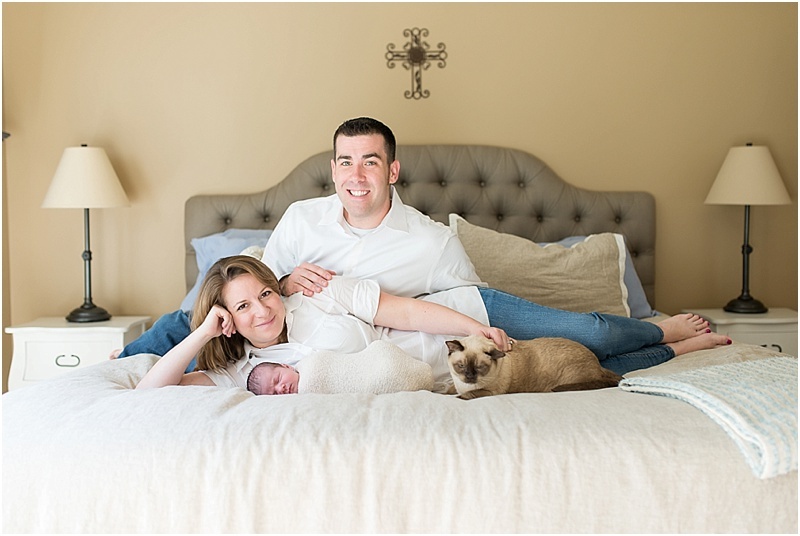 It is completely unique to you, your baby, and your family so no session is ever exactly alike! The galleries I deliver to clients are very diverse because I aim to capture a little slice of what your life is like at this moment in time. Trust me, you blink and it is gone! It's so nice to have beautiful images of your baby, but it's even more powerful to have pictures of Daddy changing the diaper of his little son who will one day stand shoulder-to-shoulder with him or of Mom whispering "Shhh...Shhh...Shhhh" into her little girl's ear as she cries. Your child will love looking back at these photos with you one day and hearing about the time you welcomed her home. 6. It shows your connection. The most important reason to choose lifestyle newborn photography is that it shows your connection with each other in a way that is emotional, genuine, and raw. I always strive to capture the love and excitement that is flowing in between mom and dad and their baby, along with their siblings if they have any. It is so incredibly beautiful! Pictures showing your connection will be treasured for your entire lifetime. That, my friend, is a priceless gift to give your child. Interested in a lifestyle newborn session? Please contact me today for more information!